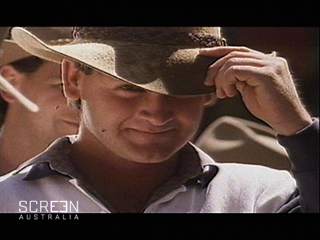 Video clip synopsis – By the 1950s Australia ‘rode on the sheep’s back’; those who grew the wool had come to symbolise and epitomise what it was to be Australian. Riding on the Sheep’s Back is an excerpt from the documentary Sheep’s Back produced in 1994. For a century, the wool industry gave Australia one of the highest living standards in the world. The economy rode high on wealth from primary exports. By the 1950s, wool was synonymous with the Australian way of life. By the 1990s, the gap between city and country people was ever widening. What does the future hold for a nation that once rode the sheep’s back to prosperity? A Film Australia National Interest Program. What have been the major social and cultural features of a post-war decade? The selective breeding of Merino ewes resulted in sheep that adapted well to the arid interior of Australia and produced wool that appealed to the mills of England. From the first boom of the Napoleonic Wars the pastoral industry enjoyed a long period of prosperity. By the 1950s Australia ‘rode on the sheep’s back’; those who grew the wool had come to symbolise and epitomise what it was to be Australian. The struggle to survive in the ‘bush’ had apparently fashioned the character of the Australian ‘battler’. Within a decade minerals, coal and iron ore had replaced wool as the basis of Australia’s economic future and wool farmers struggled to sell their product on world markets. The people of the ‘bush’ now found themselves marginalised and out of touch with the other world of Australia, the city. Note why the Australian image has changed. Note details of the traditional image. List the ‘icons’ associated with the traditional image. Note how the ‘relevance’ of this image has changed. Note what is sold using this traditional image. Note why some think it is still relevant. Note the alternative image. Implications? How has the image of Australia and Australians changed? What icons have been used to epitomise the essential qualities of being Australian? How many Australians live(d) in the ‘bush’? Write a report on the ‘bronzed Aussie’. Construct a concept map of the iconic images of Australia. Why have Australians generally been depicted as ‘battlers’ in the ‘bush’?